Prime Minister Stephen Harper approved a tentative free-trade deal with Colombia on Friday, the day before the beginning of the Asia-Pacific Economic Cooperation summit in Peru. Parliament will now have 21 days to debate the deal, which is expected to come into effect by January 2010 if all hurdles are cleared. Discussions on the pact began in 2002, a senior government official involved in the negotiations told the Canadian Press. 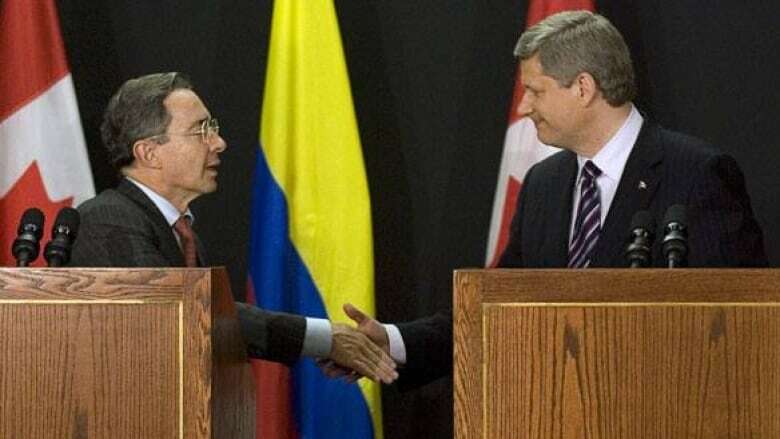 The talks heated up last year during Harper's visit to Colombia, he said on Harper's airplane bound for Peru. Harper announced the deal Friday evening after arriving in the capital, Lima, where the summit will be held. "By expanding our trading relationship with Colombia, we are not only opening up new opportunities for Canadian businesses in a foreign market, we are also helping one of South America's most historic democracies improve the human rights and security situation in their country," Harper said in a statement. The agreement would lift tariffs on 98 per cent of Canada's exports to Colombia, including wheat, barley, lentils, peas, beef, paper products and machinery and equipment. Canada and Colombia will also urge their domestic professional bodies to recognize each other's certifications, particularly in engineering. As with other Canadian free-trade agreements, the deal prohibits Colombia from exporting to Canada farm products such as eggs, poultry and dairy items. "As always with all trade agreements, [the most difficult part] has to do with agricultural market access," said the government official, who spoke on condition of anonymity. "Most of our agriculture exports now are in the grains area ... and we received immediate duty-free treatment for those," he said. A ban on Canadian beef following an outbreak of mad cow disease prevents Canada from shipping beef to Colombia. However, the official said the free-trade agreement includes provisions to expedite the lifting of the beef ban. The deal is in line with the approach Harper is likely to take at the APEC summit, where he is expected to tout free trade as an antidote to the global economic crisis. Free and open markets are the best way to ensure the global economy rebounds quickly, according to Harper, who arrived in Lima late Friday night. Senior officials have said APEC leaders will use the meeting as an opportunity to follow up on last week's G20 meeting in Washington. APEC countries are expected to sign on to the G20 plan, which created a 47-point strategy that endorsed new safeguards for the global financial system. But some analysts said Asian nations may be critical of the proposals, remembering that they were lectured by Western countries during the Asian currency crisis a decade ago to end deficit spending, raise interest rates and let failing banks fend for themselves. "If you look at our response ... to the current crisis, it's 180 degrees in the opposite direction," Charles Freeman, a former assistant U.S. trade representative for China affairs, told a briefing at the Center for Strategic and International Studies. "We're lowering interest rates, we're propping up banks and failed corporations ... and we're certainly not talking about curbing deficit spending anytime soon." Tom d'Aquino, head of the Canadian Council of Chief Executives, said APEC leaders must push hard to keep markets open. "The worst thing in the world at a time of great difficulty would be if people would try to build up barriers and fortresses against direct foreign investment or the openness of international trade," d'Aquino said. Other world leaders are expected to discuss a regional free-trade zone among the group's 21 members. Canada is also studying regional economic integration with eight of the member nations. 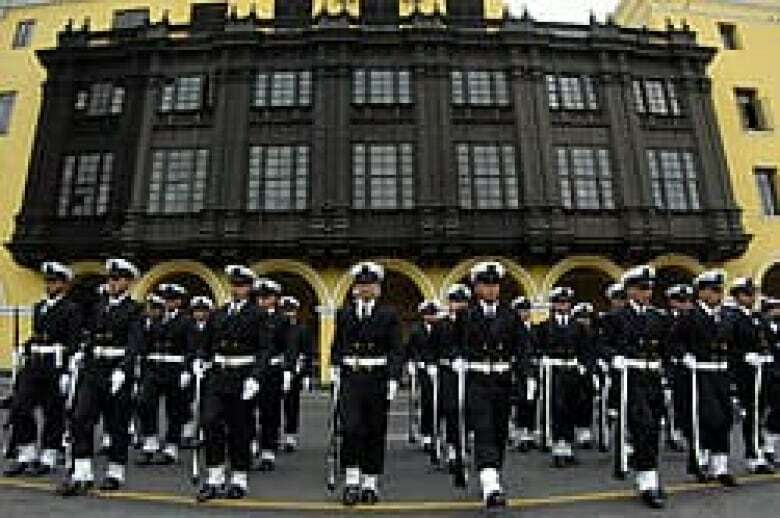 Colombia is not a member nation, although it is seeking membership. U.S. President George W. Bush walks with Secretary of State Condoleezza Rice, centre, and National Security Adviser Stephen Hadley as they leave the White House to travel to Peru on Friday. ((Ron Edmonds/Associated Press))APEC members are also expected to endorse a new commitment to wrap up the broad outline of an agreement on the current round of global trade talks, known as the Doha Round, by the end of December. However, analysts said it was highly unlikely that goal would be met since many nations will be holding back on their negotiating offers, waiting for U.S. president-elect Barack Obama to take office. "It's not necessarily a good time to be talking about new trade agreements and trade expansion because a lot of people associate that with economic uncertainty, the potential for job losses and such," said Eric Farnsworth, vice-president of the Council of the Americas in Washington. President George W. Bush will also attend the meetings, his last international summit, holding a series of one-on-one talks with other countries before the meeting begins. Bush is reportedly hoping that the APEC countries will promise not to raise new economic barriers to trade over the next year. YOUR FORUM: Week in the news - What should Harper say?